Join us on Friday, May 3, 2019 as we bring back the decade that gave us bell bottoms, 8-tracks, Disco, and more! This dynomite night will take place at Nineteenth Century Club. Invitations will be mailed in April but you can buy your tickets now! ​What is the Annual Auction & Gala? 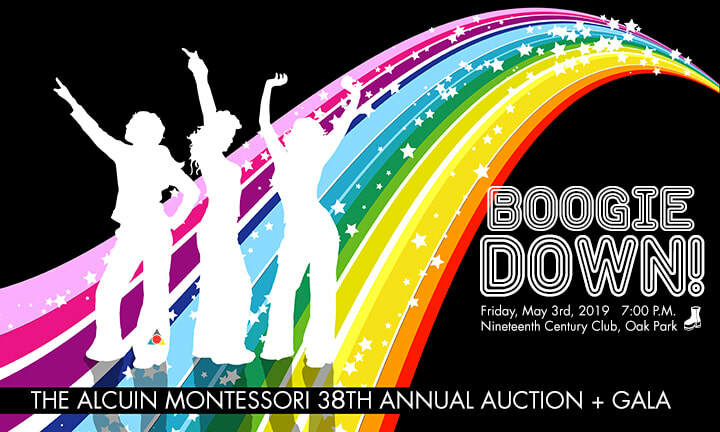 A school tradition since 1981, the Annual Auction & Gala is the largest fundraising and school event for the year. The event is a fun adults-only chance to get out for the night, mingle with other Alcuin parents, make new friends and support the school. It a fun night out! Who coordinates and organizes the Annual Auction & Gala? The event is organized by the Auction & Gala Committee, which is made up of parent volunteers. The committee works directly with the school administration, the Board of Trustees, and faculty. When and where will the Annual Auction & Gala be held? Friday, May 3, 2019, 7:00 to 11:00 p.m. When will invitations be mailed? Invitations will be mailed in April. How do I purchase tickets for the event? Please purchase your ticket online or return your reply card included with your invitation to Alcuin Montessori. Additionally you can stop by the Alcuin school office to purchase tickets. If I do not purchase my tickets in advance, can I still attend? Absolutely! Tickets will still be $75 per person at the door. However, for planning and catering purposes, we hope everyone will purchase their tickets in advance. We promise an adult only evening. Our theme this year is Boogie Down! Enjoy a celebration of everything '70s -- music, dancing, drinks with your special someone. It will be a fun evening. What is the Online Auction and how does it work? Powered by www.biddingforgood.com/alcuinauction, the online auction will run from April 23–May 2, 2019 and will feature items generously donated by national and local businesses and school community members. This is our fourth year running an online auction in conjunction with the Auction & Gala, and like last year, it allows every family to participate, even if they cannot attend the Auction & Gala on May 3rd. Additionally, you can refer as many of your family and friends to go online and bid on items. Our Online Auction audience can become limitless! All bids must be secured by credit card (MasterCard, Visa, and Amex ONLY). All items sold are "as is" and all sales are final. Winners will be notified via e-mail after the auction closes on May 2, 2019, stating the amount of your purchases(s). Items won at the online auction can be picked up at the school the following week. What is the Live Auction and how does it work? The Live Auction will take place on Friday, May 3, 2019 and will feature a limited number of "priceless" items that are only available to the Alcuin community. In keeping with tradition, each classroom is creating an original piece of art. Every year the quality of these pieces is exceptional, resulting in very competitive bidding among the student's parents. We will accept checks and credit cards (MasterCard, Visa, Discover, and Amex) for items won the night of the event. When you arrive at the event, you will need to check-in and pick up bid number. To speed up the check-out process, we will ask you to preregister your credit card into our secure system. Once the auction starts, things can become lively during the bidding. The highest bidder acknowledged by the auctioneer will be the purchaser. In the event of a dispute, the auctioneer shall determine the successful bidder. The auctioneer reserves the right to reject any bid that, in his opinion, is not commensurate with the value of the item being offered. A bid acknowledge by the auctioneer is a legal contract to buy. All items must be paid for in full and taken home by the end of the evening. All sales are final. No exchanges or refunds on auction items. Everything is sold "as is." This year, we will also feature a small number of Silent Auction events for our community the night of. These items include jewelry, hotel and cabin stays, sporting tickets and more. Can I fund a ticket for a faculty member? Yes! Donations can be made online when you purchase your ticket(s) or can be included with your reply card. Donations will be put into a general fund and distributed equally. We highly encourage everyone to come in 70s wear, but it's your night. Wear what you would on a typical evening out. Some people come in cocktail attire, others come in jeans - - whatever makes you happy and comfortable for a night on the town! Can I still donate an item for the Online or Live Auction? Yes, the Annual Auction & Gala depends on the generosity of our school community and beyond. If you know someone, or have access to airline tickets, hotel rooms, tickets to live events, restaurant and merchandise gift certificates, vacation homes, fine wines, jewelry, electronics, sporting equipment, autographed memorabilia, please email our Director of Advancement.